A good quality fence is an investment in the safety of your home and family, so you want to make sure it lasts. Vinyl is a virtually maintenance-free fencing option, but that doesn’t mean it’s totally indestructible. If your vinyl fence is subjected to the weight of heavy winter snow or hit hard. A good quality fence is an investment in the safety of your home and family, so you want to make sure it lasts. Sometimes, things just happen. Since your fence is outside and exposed to the elements, there are any number of things that could potentially cause damage. Sometimes, it’s just something small that can just be repaired, but sometimes it really is better to just replace it. Since wood is a natural material, it can be a bit more susceptible to damage than the synthetic materials. Insects, moisture, and other environmental factors can all affect your wood fence. If you notice any discoloration, warping, or splintering, inspect further to find the cause. Sometimes, protecting your wood fence can be as simple as re-directing pooling water or exterminating some bugs. 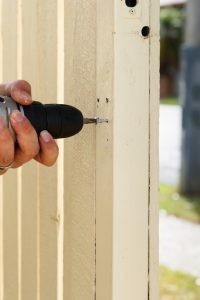 Small holes or cracks in your wood fence can be filled with wood filler or putty. If boards are warped or more severely damaged, you can just replace the affected boards. If the issue is purely cosmetic, it can be as simple as applying a new coat of paint. enough with something, it can still be damaged. The biggest problem threatening your vinyl fence is cracking. Unfortunately, the only way to repair cracks in vinyl fencing is to replace the affected sections. The good news is that as long as the rest of your fence is okay, only the affected area needs to be replaced. Like vinyl fencing, aluminum fencing is highly durable. That said, aluminum fencing can occasionally be damaged. If it’s something as simple as a loose post, that it usually just caused by soil erosion and can easily be fixed by adding more dirt. Sometimes, though, sections of aluminum fence may need to be replaced and this may require a welder. Loose pieces can be braced, but be mindful of the color of the brace if you’re not planning on painting after making your repairs. It’s always good to maintain your fence so that you don’t even have to consider replacing it. Proper maintenance ensures your fence will last as long as possible. For wood fences, this means sealing and staining regularly, while vinyl fences just need to be sprayed down with a garden hose. Sometimes, maintaining your fence could mean making different choices with your landscaping. For example, letting vines grow on it may harm your fence. Be sure to check for any damage regularly. Making a few small repairs now could save you a lot of time, effort, and money in the long run. This entry was posted on Friday, July 28th, 2017 at 9:13 am. Both comments and pings are currently closed.